Coolmore keeps a band of specially selected foster mares in case a mare is unable to rear her own foal through illness, injury or death. Plenty of top-class horses have benefited from a Coolmore foster mare including dual Gr.1 winning miler The Gurkha who instantly bonded with his new mum “Tina” at two days old. More recently the Galileo filly foal out of the late Champion Royal Delta was fostered to experienced foster mare Ginger, the pair pictured here at Coolmore. Like any of the foster foals at Coolmore, Ginger's own foal is being hand-reared and when old enough will be weaned onto bucket feeding. The foster mares are chosen for their excellent temperament and robust constitution which their foals inherit. They quickly settle and thrive in their new routine, bonding with other foals of a similar age. Most of the foster foals are re-homed as due to their placid nature they make wonderful mounts for both children and adults. A number will also remain at Coolmore, the fillies eventually becoming foster mares themselves while the colts make excellent teaser stallions. Watch a video on the foster mares at Coolmore here. The foals that are re-homed often go on to excel in a variety of disciplines and we regularly get updates on how well they’re doing. “Muncher” is the huntman’s horse for a Co Cork based hunt and is pictured leading the pack earlier this year. The huntsman’s horse has to be strong, brave and athletic, “Muncher” has impressed so much that his owner has since re-homed several more Coolmore foster foals! Pictured below on his farm in Co Cork. “Fionnuala’s Misty” was successful for her young owner in show-jumping, eventing and pony club competitions and is now competing at a high level in Sweden. “Guinness” was re-homed with a local jockey and they’re pictured here jumping through a castle keep and clearing a stone wall in style on a cross-country ride in Co Tipperary. “Babe” and “Bambi” are multitalented sisters. Both re-homed from Coolmore, Babe (on the left) is the elder of the pair and was joined a few years later by Bambi. The mares hunt and hack out regularly during the winter, they are also trained to harness and in the summer-time are driven as a carriage pair, occasionally even drawing a funeral hearse! "Nellie the Nanny" a 31-year-old Shetland pony mare has been invaluable in helping raise a good number of Coolmore foster foals re-homed with a local lady. 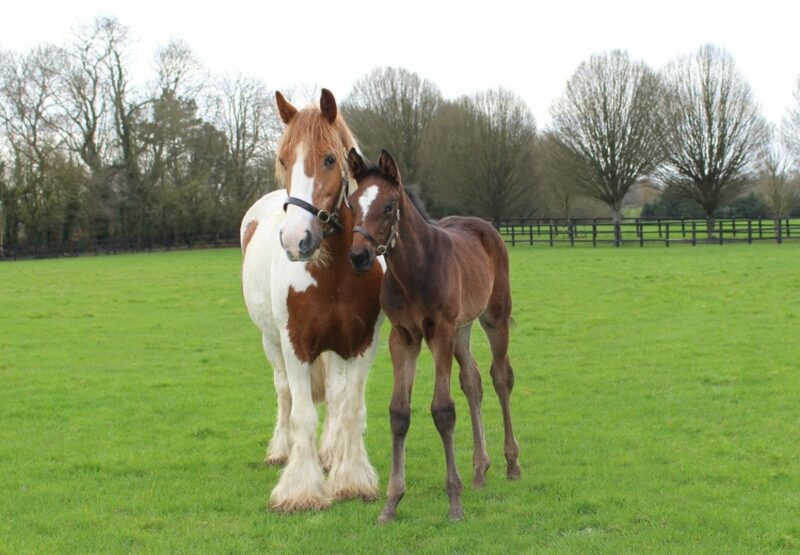 “Eddie” pictured as a foal before he was re-homed and later as a four-year-old trotting through the village of Fethard. He is now in Sweden as a riding horse. The beautifully marked “Mojo” was broken in as a three-year-old, an excellent jumper he now hunts regularly in Co Tipperary. “Mikey” is a top-class cob with a wonderful temperament! An ideal family horse, he is now in England where he has made an excellent hunter.